Buy the Farm . . . Share: Bock and Blue and Chowder Too! We woke up this morning to another flood alert which, thankfully, never materialized. It did result in a stressful morning watching the water slowly creep up the street and threaten to make our lives difficult. Thanks to flood alerts I've been waking up at 5:00 AM every morning, mostly just to go to the window and make sure we're not floating somewhere in the Long Island Sound. With Jen working late tonight I was in need of a snack after work. 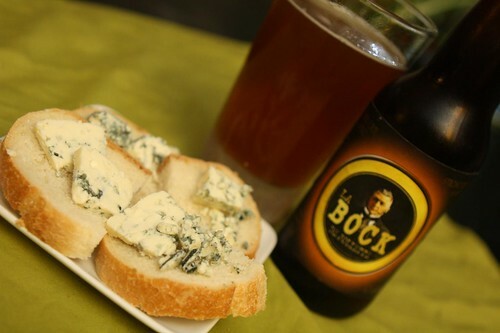 I put some nice Danish blue cheese on some fresh bread and enjoyed it with this Bock from L'Alchimiste. The two worked together phenomenally well. It could have just been that I was starving when I got home but this was a delicious pairing. The Danish and Quebecois should pair up more often. 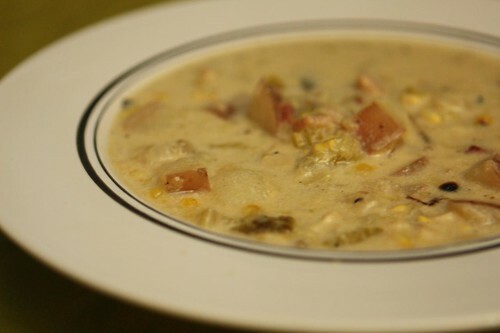 As Jen was working late and I'd had a pretty long day as well I decided to make a variation on one of Jen's favorite dishes: New England Clam Chowder. I started by grilling New York corn and Biscayne peppers from the farm. After letting them sit for a bit I rendered some bacon in a pan, added the farm leeks, a little butter, some celery, and chopped red bliss potatoes and let this cook for a bit. After the potatoes had become a little tender I added some clam juice, cream, milk, salt, pepper, and cooked it down for a while. At the end I finished it with some roux. I was going to add some chopped parsley to the soup as well until I discovered a nasty little worm living amongst the slightly rotten leaves. I could have sworn I bought that parsley recently. After making the soup I fell asleep on the couch for a while, woke up in a panic that I was late and just made it to pick Jen up from the train station before returning home for dinner. With no forecast of rain for the next twelve hours or so that will mean I might get a full night's sleep without having to wake up and check out the window to make sure the rental car has not floated away. I guess I don't deal with moderate trauma very well.